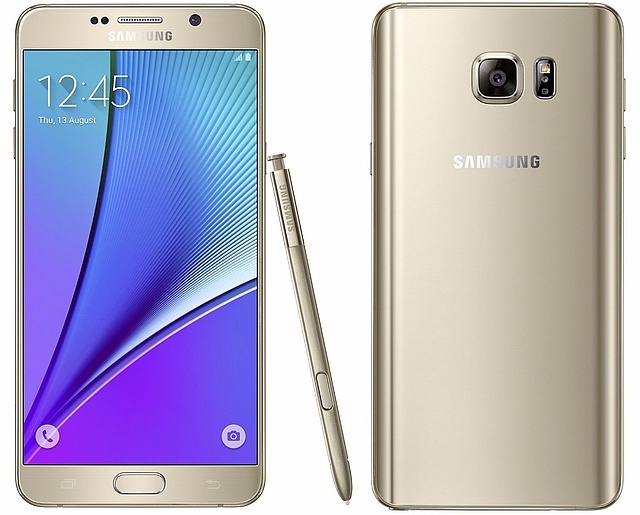 The golden Galaxy Note 5 from Samsung does not use 24K gold, but is also affordable, having the same price as the white and black versions. Custom-made, gold-plated handsets are quite expensive, but those looking to get a Samsung Galaxy Note 5 with a gold platinum finish can get the same looks for a fraction of the price. The gold platinum variant of this phablet comes directly from Samsung, and now customers in the United States can get it from AT&T and Verizon Wireless. Although T-Mobile was the first one to list this model, they pulled back that page and it appears like it is not coming back in a day or two. AT&T has the 64 GB gold platinum Note 5 ready to ship for $349.99 USD with a two-year contract, while the full retail price is $839.99 USD. There is no gold variant for the 32 GB version, unfortunately. Verizon Wireless, on the other hand, has only a 32 GB gold platinum model listed, but the smaller capacity also comes with a smaller price - $696 USD. Qualified customers can also get it for 24 monthly payments of $24.83 USD each, which means they also get a price cut of $100 USD.